Stuck in a Technology Rut? Self-Signed SSL Certificates are a great way to setup temporary test and development servers. They are also a great way to utilize Microsoft and Linux services with a small group of people such as your office staff. There seems to be a lot of confusion and head scratching out there though concerning the method and steps to properly deploy a self-signed ssl certificate amongst desktops, servers and devices of the Microsoft and Linux variations. With a series of how to posts, I plan on showing you how easy it really is to use these types of certificates to your advantage. SSL Certificates are digital keys used to authenticate network entities such as a client or a server. It is most famous for acting as the key for encrypted website transactions between a company’s server and an Internet user’s browser. If you ever purchase anything from an eCommerce website or accessed your bank account or other Financial Institution, you have used a Secure Socket Layer Certificate to ensure the trust between that server and your browser. SSL Certificates can also be used to secure other types of Internet Traffic such as Email including POP3, SMTP, IMAP and Microsoft Exchange. When a client starts up a conversation with a server and requests that a Secure Socket Layer is created between the two parties, the server responds to the client with its SSL Certificate. 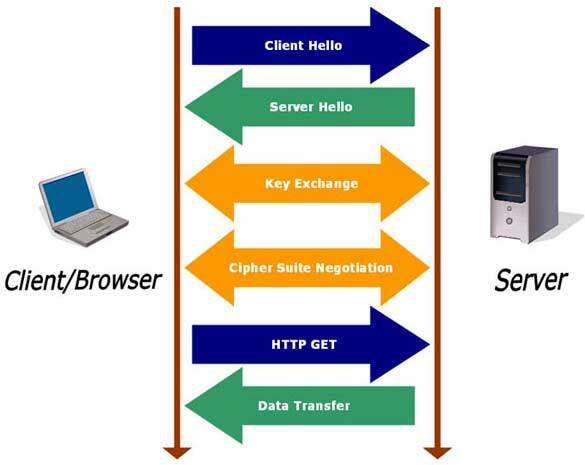 The client can then validate the authenticity of the server ensuring that the server is who it claims to be. To authenticate that identity, the SSL Certificate is signed by a Certificate Authority (CA) such as Verisign, Thawte, a web hosting company such as Go Daddy or another trusted third party entity. The SSL Certificate comes with one of these trusted Certificate Authority signatures. When the client follows the Chain of Trust which can be checked against the CA’s public key, it can determine if the chain is acceptable by comparing the chain to the root certificates each operating system includes. A self-signed certificate differs in that it has signed itself, therefore it has no chain of trust. When a client receives such a certificate, it will warn the user that the certificate cannot be verified. Obviously, if you are attempting to setup a server and services that will be used by other Internet users you do not know, you will want to purchase a legitimate signed certificate. However, if you are attempting to set services up that will be used for internal company use, you can become your very own Certificate Authority for FREE! Stay tuned for more details very soon! Does some seedy web site appear every time you open your browser? Do pop up ads bombard your computer all hours of the day? Are spy-ware programs on your computer that will not go away? If so, read below to rid yourself of this annoying and most of all, hazardous problem. In this four part article, of which this article on Spy-ware is the first part, I will discuss what Spy-ware is, and how you can cleanse your computer of it. Generally, Spy-ware refers to software that executes tasks on your computer without requesting your consent. While the term suggests software that covertly monitors the user, it has come to refer more broadly to all software that sabotages your computer’s normal operation to profit outside individuals. But don’t confuse Spy-ware with hacking or cracking of your computer. It differs in that it showers you with unwanted advertising and the collection of your personal information, Spy-ware clearly immerges as a threat not only to your sanity but also may lead to identity theft. 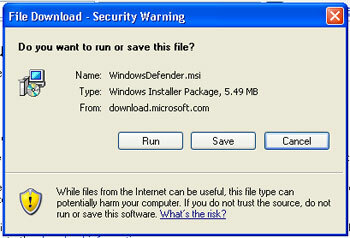 Shouldn’t your Anti-virus scans protect you against Spy-ware? Absolutely not, it is a totally different animal! Like many viruses, Spy-ware exploits infected computers for profit. However, Spy-ware varies from viruses and worms because it does not self-replicate. Typical tactics that Spy-ware employs are the delivery of unsolicited pop-up advertisements; theft of personal information (including financial information and credit card numbers); monitoring of Web-browsing activity for advertising purposes; or routing of HTTP to target advertisements for a tailored-to-fit exploitation of your web searches by advertising sites. Click the Download It Here button. Select your PC’s desktop and then click Save in the Dialogue Box. Once the program downloads, click Run. 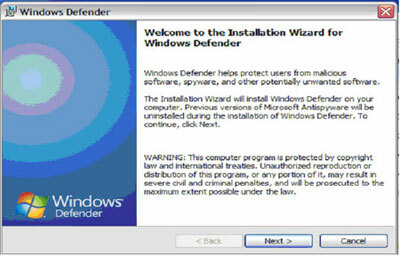 Follow the install Wizard by pressing Ok. 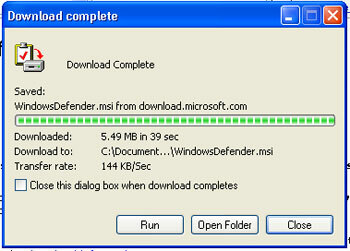 Choose the Recommended Download option. Lastly, click Install when prompted. 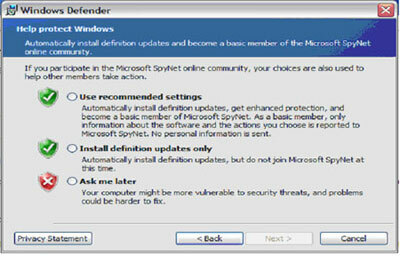 Open Windows Defender and click the Check Now button to update the spyware definitions. 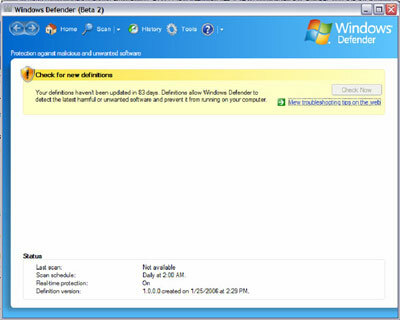 To scan your PC for spyware, just click the scan icon at the top of Windows Defender. Give your scan time to run, it usually takes less than five minutes, but don’t interrupt it if it is scanning. Oh yes, it can be done! Access Your Programs with the Touch of ONE Button! Right click the application you want as a shortcut, and click Properties. Click and type your desired shortcut keys such as: Shift + or any other desired keys. The only rule is that you must choose two modifier keys (Ctrl, Alt) and, or a function key. 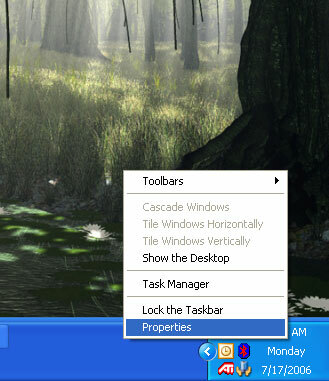 Lastly, close the property window by clicking OK, and have fun playing with your one-touch shortcuts! To remove the shortcut key, return to the “Shortcut Key:” field by following steps 1 and 2 then remove the shortcut by using the backspace key. Then click OK, which will remove the shortcut key assignment. 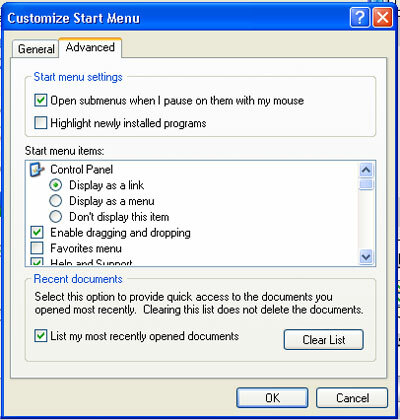 Right-click of the icon or file, and choose “Copy” from the menu. 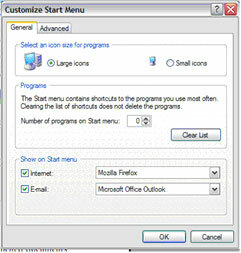 Then Right-click on the desktop, and choose “Paste Shortcut” from the menu. 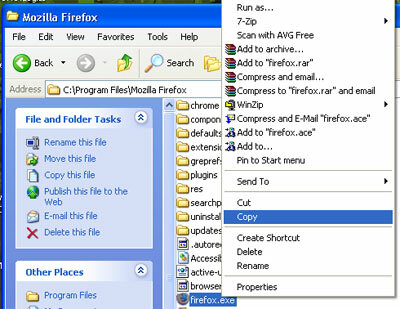 Open “Windows Explorer,” and locate the file you would like to create a shortcut of. 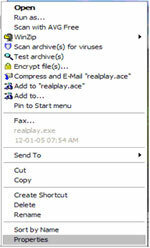 Then, right-click on the file, choose “Copy” from the menu. 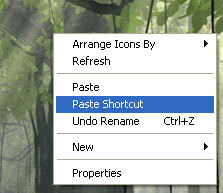 Lastly, -click on the desktop, and choose “Paste Shortcut” from the menu, to place the shortcut on the desktop. Tired of hunting for those programs you use all the time? Wishing they were all grouped together in one easy-to-access area? If so, read bellow to end your tedious searches. Place the mouse arrow over the Taskbar, and right click to access the Taskbar menu. Select the “Start menu” option. Then, click the Customize button. Click the Small Icons, to select the appropriate icon size. Click on the Advanced tab in the “Customize Start Menu” window. 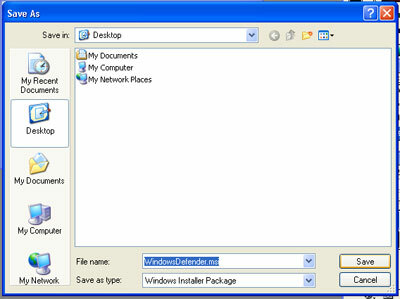 Located at the bottom of the window, uncheck the “Highlight newly installed programs.” option. Lastly, click and hold the left mouse button over the program you want to add to the shortcuts menu, drag program and drop into the menu. Wish you could express your individuality, represent your business in a unique and creative way, or just looking to include your contact information without having to type it all out? 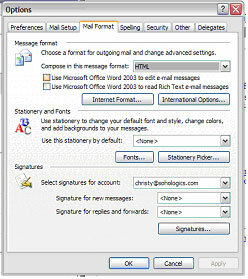 Microsoft Outlook has an answer, with its capability to sign each of your outgoing emails with a generic signature. Wanting to express yourself? Click Tools, and then select Options. After the “Options” dialogue box appears, select the Mail Format Tab, and click the Signatures button. Click the New… button, and another dialogue box should appear. Enter a title for your new signature, and click Next. Enter your desired Signature within the field, editing where desired with the Font… and Paragraph… buttons for more personality. Copyright 2000 - 2019 SOHOLogics, Inc. All Rights Reserved. Web Design and Search Engine Optimization by SOHOLogics. Submit your site to the Hotvsnot.com web directory!